Australian Government politicians often begin media announcements about energy with the phrase "What do you do when the sun doesn't shine and the wind doesn't blow?" I suppose they often ask this because they don't know the answer. If they did, surely they'd have stopped asking themselves the same question ages ago. Another over-used phrase the Australian Prime Minister repeats to himself is: "When you flick the switch, you want the light to come on." Many old people still think the electricity grid runs like it did in the 1950's: demand for electricity sprang up from the random actions of countless people flicking light switches on and off willy-nilly and the electricity generation and distribution system, startled by all this activity, sprang into life to send the right number electrons down wires to make their lights come on. Today, managing electricity supply and demand is much easier. It is also a lot cheaper: it was expensive to keep enough capacity spinning at all hours of the day just in case another 300 or 400 people suddenly flicked on light switches at the same time. Weather forecasts make it easy to predict a day ahead how much energy any customer is going to need and how much energy the customer's solar panels are going to generate. Data on customers' energy use and production at five minute intervals is available with historical data for several years with which to predict changes from season to season and forecast energy demand on exceptionally hot or exceptionally cold days. It is available for analysis at PVOutput which is a free service for sharing and comparing PV output data. 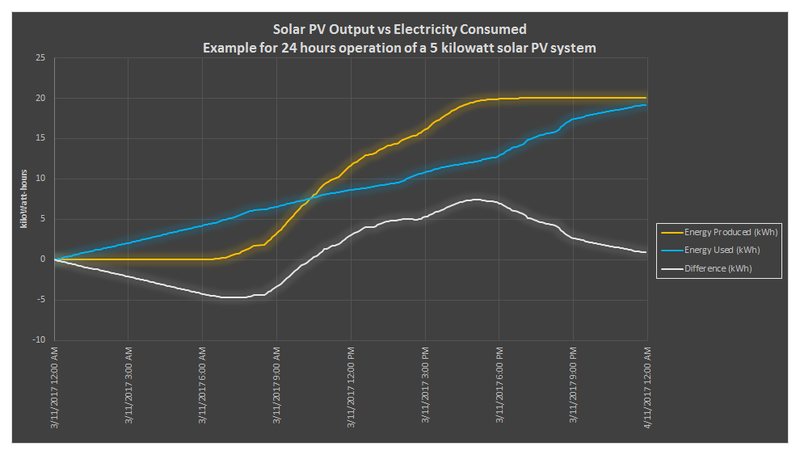 The chart shows output from a 5 kilowatt solar PV system - that begins generating electricity about 7:00 am in the morning and ceases generation about 5:30 pm - producing a total of 20 kilowatt-hours of energy for the day. Also shown is the energy consumption by appliances in the household. Though this seems to proceed at a fairly steady pace through the day, details in the source data show that there are a number of short bursts of energy use and relatively quiet periods. The grey line shows the difference between energy generated and energy used. The total produced for the 24 hour period on this day was slightly above the total used. The solar panels however didn't produce energy early enough in the day to match the energy used before 9:00 am, and stopped producing electricity when the total amount used was only about 12.5 kilowatt-hours at 5:30 pm. Beginning the day with 5 kilowatt-hours stored energy would have supplied the morning energy needs in the hours before the solar panels began to produce enough energy to meet the demand. Adding about 12.5 kilowatt-hours of solar energy to the battery by 5:30 pm would be sufficient to continue meeting demand for the rest of the day. As the total energy generated for the day was slightly greater than the total consumed, the battery would end the day at about the same level of charge it had at the start of the day - ready to repeat the process the next day. If the energy used was a little greater than initially predicted, or the amount generated was a little below the amount forecast a day earlier, the battery would end the day with a bit less than the 5 kilowatt-hours of energy stored that it held at the beginning of the day. The battery management software could then place an order for a 'top-up' to be sent to it after midnight - while spare generating capacity and distribution assets are sitting idle doing very little. The automated battery 'top-up' order could be modified by energy management software to take into account the weather forecast for the following day. Energy is very cheap to generate and deliver after midnight: beat the rush, save money. So the next time someone asks "What do you do when the sun doesn't shine and the wind doesn't blow?" tell them.